Time is hard to come by these days. It seems like we’re always running from one thing to the next. Constantly in motion, trying to cram everything we can into 24 hours. At least that’s where I am right now. With the end of the semester just a week and a half away, I’m deep in essays, midway through the editing process of video assignments and trying to prepare myself to study for finals. To be honest, the end of November and beginning of December is definitely not the most wonderful time of the year. It is completely draining. There is a light at the end of the tunnel though, and that comes on December 9th when I have an entire month off before classes resume. That means that it’s time to go crazy with holiday baking. What’s everyone planning on baking this year? I have some yummy new recipes up my sleeve and of course I’ll be making some of my favourite old classics like Ginger Molasses Cookies and Chocolate Snow Caps. I also have a fun announcement! I was picked as one of four blogs as Jamie Oliver’s Food Revolution Blogs of the Month for the month of November 2011! As a big fan of his Food Revolution, and someone who focuses on healthy eating and living, I’m so excited and honored to have been chosen! 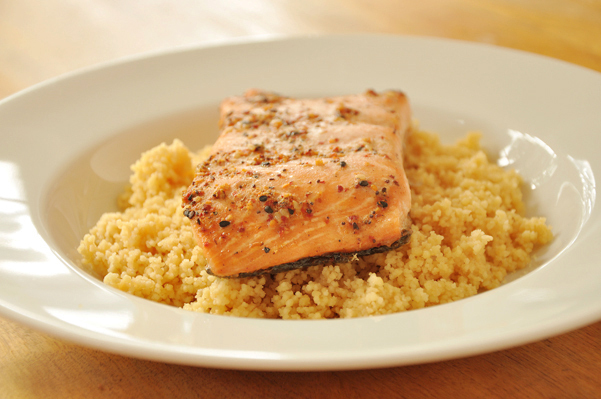 Speaking of being healthy, we all know that salmon is one of the healthiest proteins out there. It’s easy and quick to cook and so satisfying. If you know me, you know that I’m not usually one who buys pre-made spice mixes, especially if you can just make them at home. However, as with most rules, especially French grammar rules, there are a couple of exceptions. Those exceptions include a Japanese 7-spice blend and Chinese 5-spice blend. I don’t use the individual spices enough on their own to warrant having an entire jar or bag of each, so having a pre-made mix is ideal. These mixes can be found in most grocery stores and they add great flavor to your dishes. Place salmon on a lightly greased baking dish skin side down. Whisk all remaining ingredients together and brush on top of the salmon fillets. Super easy and delicious – Japanese Spiced Salmon is definitely another salmon dish to add to your repertoire! is soya sauce the same as soy sauce? Thank you. Congratulations on your honor! Woot! I haven't tried a 7-spice blend, its on the list now! What wonderful news! Congratulations! Your salmon looks delicious! Will keep the recipe in mind when my salmon arrives from Alaska!